1. 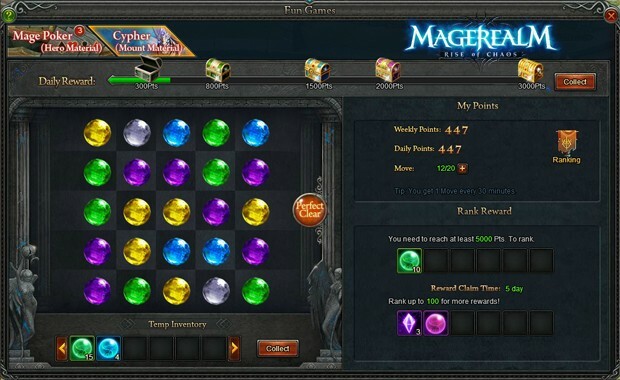 Use 1 move to switch the gems. 2. Clear 3 gems of same color in a row and get points. 3. More combos, more points, higher chance to get items. 4. 1 move is added every 30 minutes until it reaches the cap. 5. You may buy extra moves with Diamonds/Realmgems. More purchase attempts with higher Federation level. 6. Use Perfect Clear to clear all the gems at a time. More purchase attempts with higher Federation level. 7. Reach certain points to get Pts. Chests. The points reset at 5:00 a.m daily. 8. You need to reach at least 5000 Pts. To rank in Weekly Rank. Only Top100 will be awarded. 9. Weekly Rank resets at 5:00 a.m every Monday.